The American Armor Foundation just provided it’s 41st ballistic vest since our official launch in September 2016! This is very exciting news for us and even better news for the 41 officers and deputies across the country who now have the basic ballistic protection they deserve while serving their communities! None of this would have been possible without the generosity of our individual and corporate donors and we cannot thank you guys enough for believing in our mission and trusting us with your gift! As exciting as the past couple of years have been, we have huge goals for the future of our organization and look forward to exponential growth in terms of grants, outreach, and donations going forward. One specific need in this area that will help us with outreach and PR is a vehicle that we can use in parades, at events, and while delivering body armor. Our goal for any donated vehicle is to have it “marked” with an attractive vinyl wrap that draws attention and conveys our mission. My research has revealed that other nonprofits have been successful in having everything from brand new vehicles to old patrol cars donated for this very purpose. While we are in no position to be picky, the ideal vehicle would be a pickup truck (larger surface area for the wrap) or a Dodge Charger (in keeping with the police theme) and we are seeking your assistance in making this happen. 1. Share this message: Chances are, someone you know may have a vehicle to donate or knows someone who does. This could be someone who works for or owns a dealership, a company with a fleet, or an individual. Vehicle donations are tax deductible! It doesn’t matter where the vehicle is, if it will work for us we will come get it! 2. Donate your vehicle: if you have a vehicle that you believe will work for this purpose and would like to donate it (again, it’s completely tax deductible), reach out to me at 678-300-3357 or via email. As stated above, it doesn’t matter where the vehicle is, we’ll come get it! 3. Donate to our vehicle fund: your tax deductible gift will be earmarked to be used specifically towards the purchase of a vehicle (if one isn’t donated) or the upkeep of any vehicle that is donated. We know that a vehicle seems like a big ask, but we know it’s doable because we’ve seen it done by other nonprofits serving law enforcement and many other industries. Getting this done will take one of two things: either the ONE right person has to see this or several believers with a few dollars have to see it. Either way, we can make this happen and it starts today with your help! 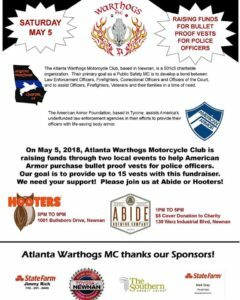 On May 5, 2018, the Atlanta Chapter of the Warthogs Motorcycle Club hosted a ride and fundraiser for the American Armor Foundation for the purpose of assisting the organization purchase more body armor for agencies in need. 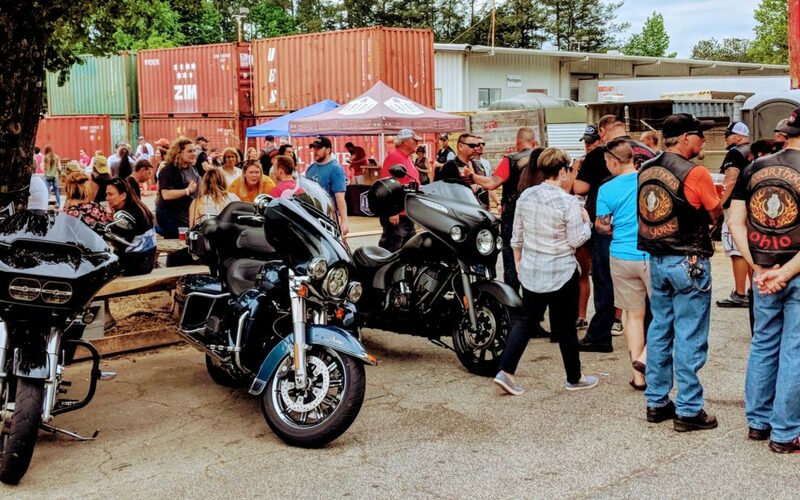 After a great morning ride, attendees enjoyed awesome craft beer and live music at Abide Brewing and then food and raffles at Hooters of Newnan. The event was a definite success! Abide Brewing donated $700.00 to American Armor from cover fees, $348.00 in cash was collected and donated directly to the organization during the event, and The Warthogs presented the foundation with a check in the amount of $2,111.63 for a grand total of $3159.63 – enough funding for 7 vests! We deeply appreciate the Warthogs leadership and their members, Abide Brewing, Hooters of Newnan, and all of the attendees who made this event such a huge success! If you’re interested in hosting an event on our behalf, please reach out to Brandon via email at brandon@americanarmor.org. 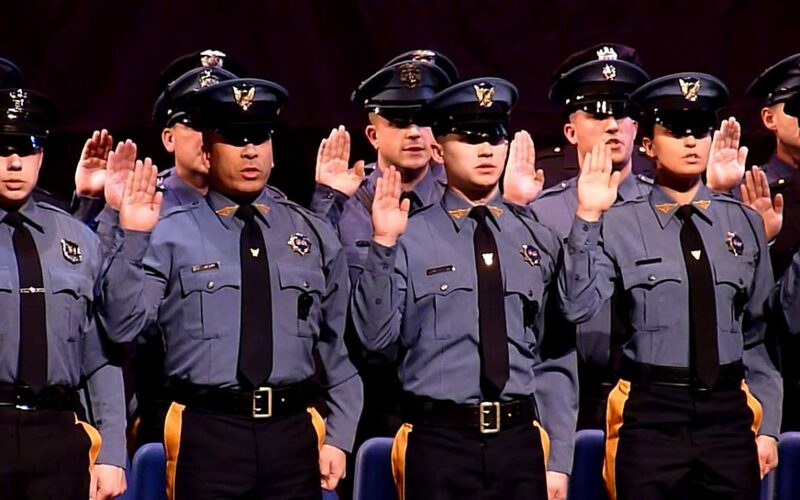 Tyrone, Ga. – A group of law enforcement officers in Oklahoma, Kansas, South Carolina, and Georgia no longer have to perform their risky duties without the protection of body armor after receiving grants from the American Armor Foundation. To those outside of law enforcement, it’s logical to assume that every officer is issued body armor as part of their standard equipment, but this is not the case in every department. The equipment, ranging in price from $500 to over $1000 per unit, is out of reach for many small departments across the United States. “Conservative estimates place the number of U.S. officers working without a vest at over 100,000”, according to Brandon Perkins, the Founder of American Armor. Agencies most at risk of being underfunded and unable to provide vests to their officers employ 10 officers or less and serve a population of 10,000 or less. According to data from the Bureau of Justice Statistics, that demographic employs about half of all U.S. officers and these are the agencies American Armor targets for their Body Armor Grant Program. This distribution brings the total number of officers protected by American Armor to 35 since its official launch in 2016. The American Armor Foundation is a registered 501c3 public charity and relies on charitable contributions from individuals and corporations for the funding necessary to provide officers with body armor. In order to make every donated dollar go as far as possible, the organization has arranged a pricing agreement with SRT Supply, Inc. to purchase new Point Blank body armor for about $450 per unit. “Given the full retail cost of new body armor, we’re extremely grateful for this relationship with SRT and Point Blank. It helps us protect more officers with our limited funding”, Perkins said. Interested parties can learn more about American Armor on their website at www.americanarmor.org. For those interested in making a tax-deductible donation, the organization provides several options including one-time gifts, monthly contributions, and vehicle donations. 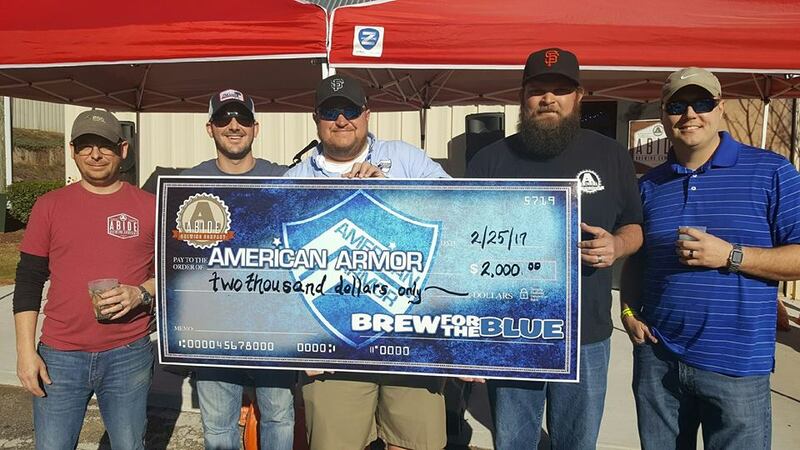 Abide Brewing Company, a microbrewery located in Newnan, Georgia, hosted Brew for the Blue on Saturday February 25 and helped us raise $2,000! Much of the funding was generated from the sale of $1, $2, and $5 raffle tickets for items that had been donated by local businesses. Prizes included multiple gift cards to local restaurants, range passes to Atlanta Range and Ordnance, Falcons merchandise, Bluetooth Speakers, a Yeti Cooler, and a custom knife from Southern Grind. Abide kicked in an additional $700 from entry fees. This was our first fundraiser event of its kind and we’re proud of the outcome. With a little luck, it will become an annual event for us! We thank everyone who came out in support of our cause! 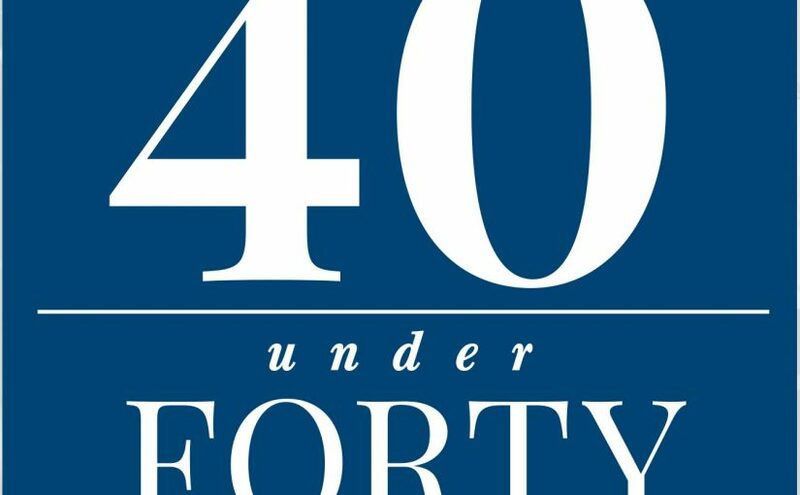 The Board of Directors is excited to announce that Chief Brandon Perkins, the Founder & Executive Director of American Armor, has been selected by the International Association of Chiefs of Police (IACP) as one of its inaugural 40 Under 40 award recipients! “CHIEF BRANDON PERKINS grew up surrounded by law enforcement because his father, a former police officer, had many friends in the profession. Because of this, Chief Perkins grew up knowing what it means to wear the uniform and the badge. As the chief of the Tyrone Police Department since 2007, he maintains that level of dedication and service he grew up seeing as a child. He is constantly looking for ways to make the department, his officers, and the community better. 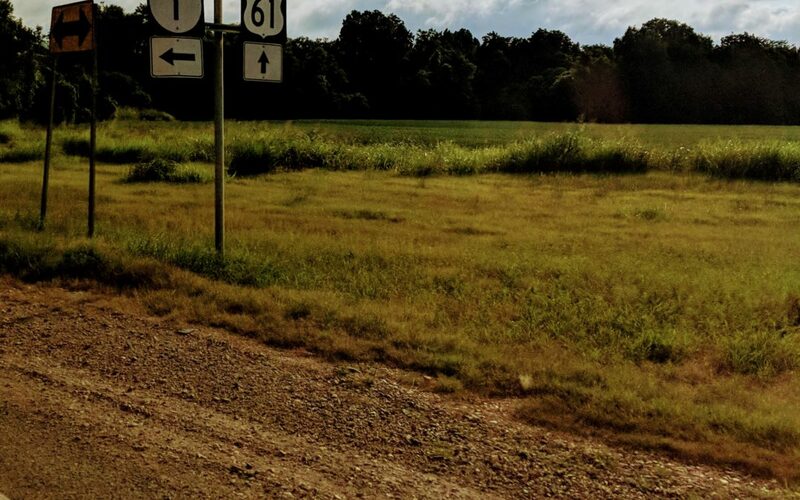 As a result, Tyrone, Georgia, has ranked in the top eight safest cities in Georgia for three years straight and has experienced a 50 percent reduction in violent crime rates. In 2015, Chief Perkins founded the nonprofit American Armor Foundation, Inc., which assists smaller law enforcement agencies across the United States afford body armor for officers. Chief Perkins strives to make well-informed decisions that have a positive impact on the community every day. He is driven by the feeling of accomplishment that accompanies the implementation of a successful process that gets positive results. ©2017 American Armor Foundation, Inc. All Rights Reserved.